Anyone have experience with these holsters? I'm looking at the lighttuck from them and the infidel from Comp-Tac. I have two comp tac holsters and want to stick with the single clip so it's easy to put on and take off. The comp-tac rides a bit high and the plastic clip isn't the most sturdy. Reviews all seem to be pretty good. Any first hand experience? I guess the answer is no. Anyway seems like a well made holster with a solid clip,rides close to the body, has adjustable height and cant as well as adjustable retention. I prefer hybrid but figured I'd give this a try. 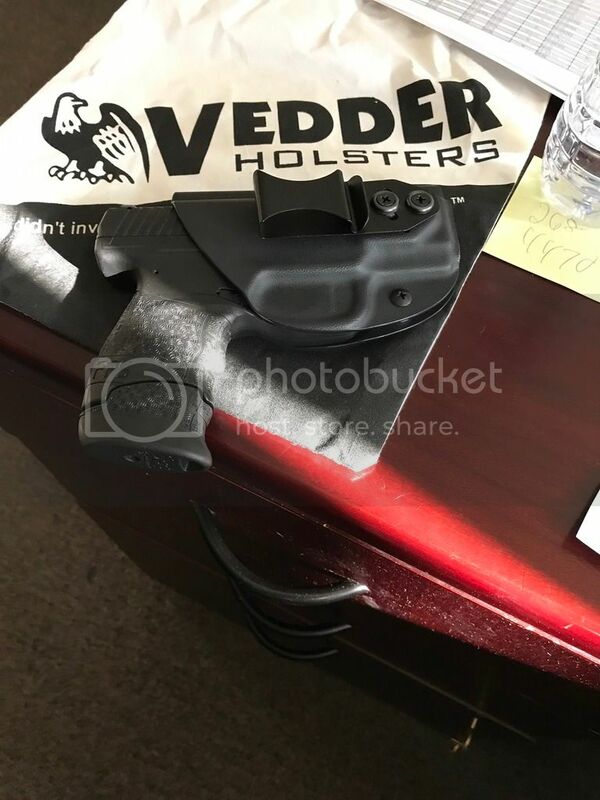 I reciently purchased the same Vedder for my PPS. I purchased the similar holdster from Clinger for my CZ and I definitely prefer the metal clip Vedder uses. Clinger encases both sides of firearm including mag release. They also allow you to switch the clip from one side to the other. Vedder trims the side facing outward making it devoted to carrying on the side you chose when ordering. Uses less material, and feels less bulky. I prefer the Vedder even priced slightly higher. Both are really good IMO. How is the pivoting around the single clip? The few single-clip holsters I've tried I hated. Vedder has better pivoting options as it slides to a range of degrees. Clinger has 2 top holes allowing you to choose between 2 angles only. If that makes any sense. Sorry. I'm referring to the tendency of a single clip to pivot on your belt, undesirably, even when using a belt of the proper width. The wider the better the clip, the greatly this is reduced though, but it's a much bigger issue with single-clip holsters than doubles.